We get more of them in the winter months. Is this a side-effect of the natural temperature-sensitivity of almost all respiratory viruses? Please CLICK ON AN IMAGE to open it in a new tab. 1. 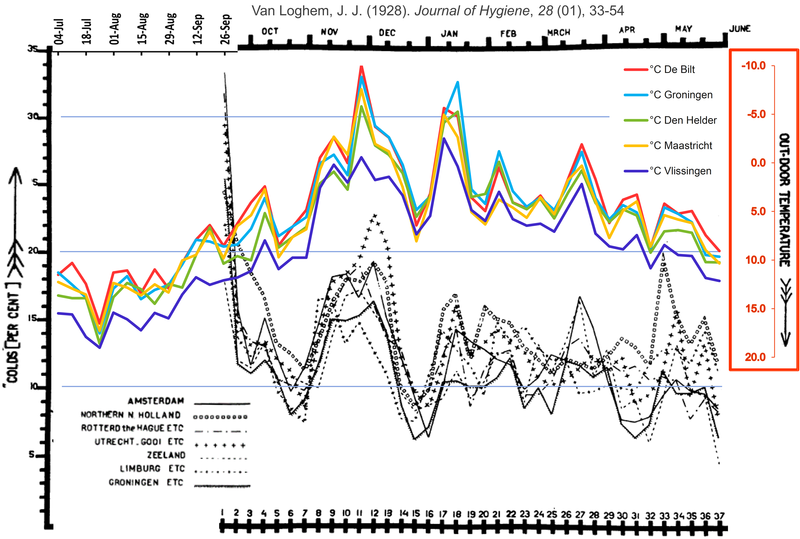 – Graph II from van Loghem’s report on the epidemiology of respiratory illnesses in the Netherlands in the winter of 1925/26. I have superimposed ambient temperature at five Dutch weather stations (colored lines) with the temperature scale inverted (lowest temperatures at the top). From Van Loghem JJ. J Hyg 1928; 28(01):33–54. 2. 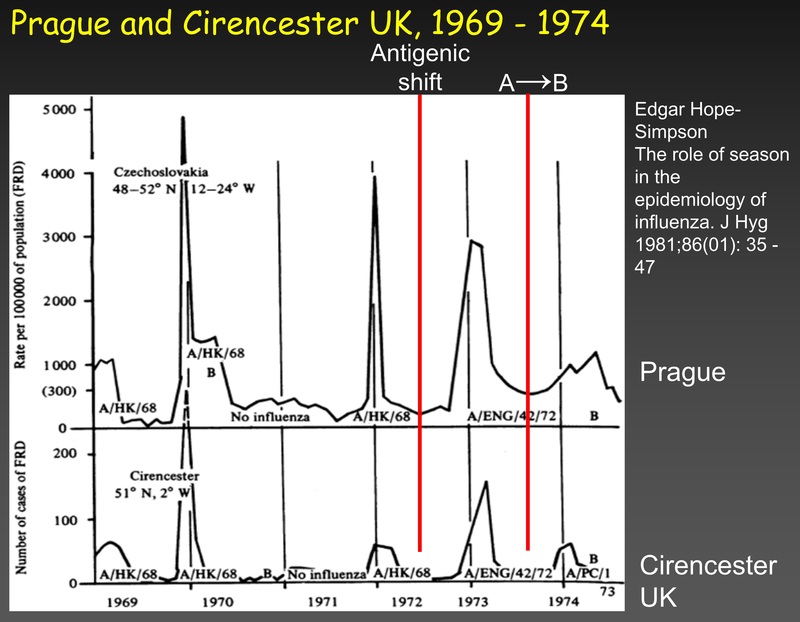 – Hope-Simpson’s record of feverish respiratory illnesses in his medical practice in Cirencester, UK, compared with notifications of such diseases in Prague, Czechoslovakia 1969–74. From Hope-Simpson RE. J Hyg 1981; 86(01):35–47. 3. – The viruses that caused respiratory tract infections in hospitalized children in Mainz, Germany, which has an oceanic climate, 2000 – 2008. The four most frequent pathogens were, in order, rhinovirus (RV), respiratory syncytial virus (RSV), influenza A (IVA), and adenovirus (AV). From Du Prel JB et al. Clin Infect Dis 2009; 49(6):861–8. 4. – The viruses that caused respiratory tract infections in hospitalized children in Buenos Aires, Argentina, which has humid subtropical climate, 1998 – 2003. The four most frequent pathogens were, in order, respiratory syncytial virus, influenza A, adenovirus, and parainfluenza. From Viegas M et al. J Infection 2004; 49(3):222–8. 5. – The viruses that caused respiratory tract infections in hospitalized children in Singapore, which has a tropical climate, 1990-94. The four most frequent pathogens were, in order, respiratory syncytial virus, parainfluenza, influenza A and adenovirus. Chew FT et al. 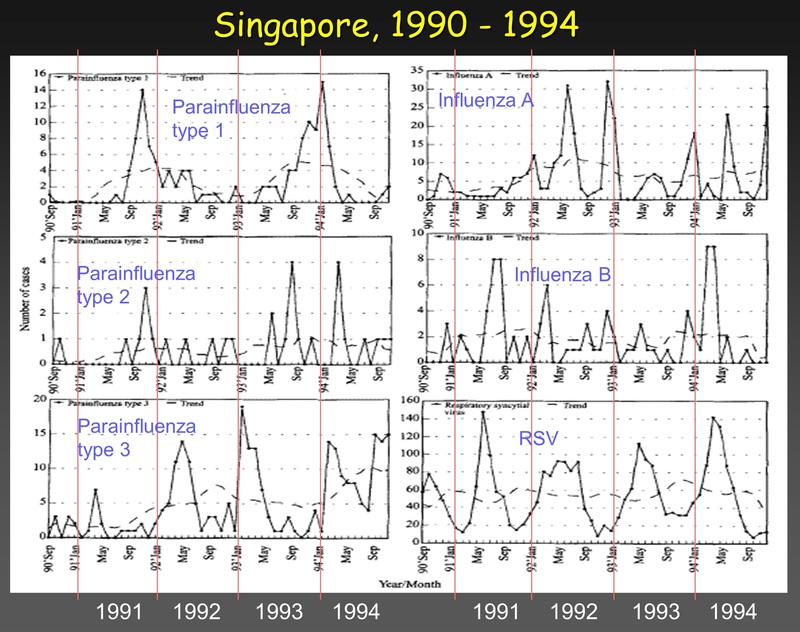 Epidemiol Infect 1998; 121 (01):121–8. 6. 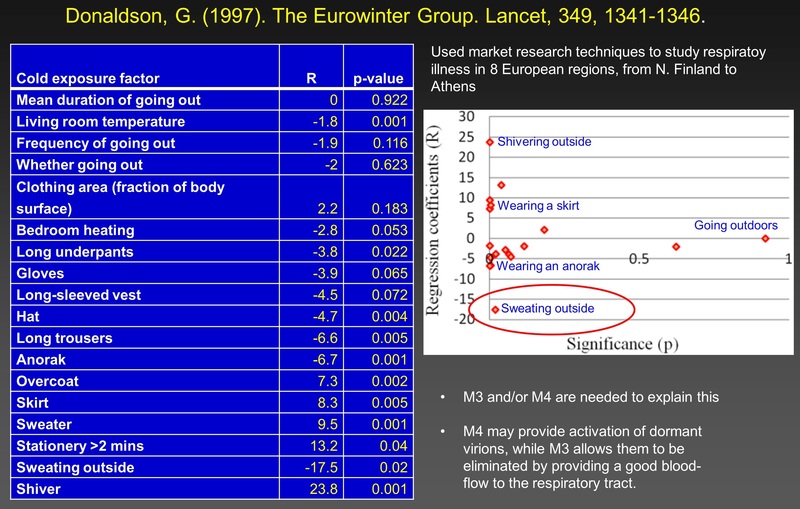 – The Eurowinter Group analyzed the climate and the measures taken to protect individuals from cold in eight European regions, ranging from northern Finland to Athens. The table shows the regression coefficients (R) and their significance (p), for cause-specific indices of respiratory disease-related mortality on personal cold-exposure factors standardized at 7°C mean daily temperature. 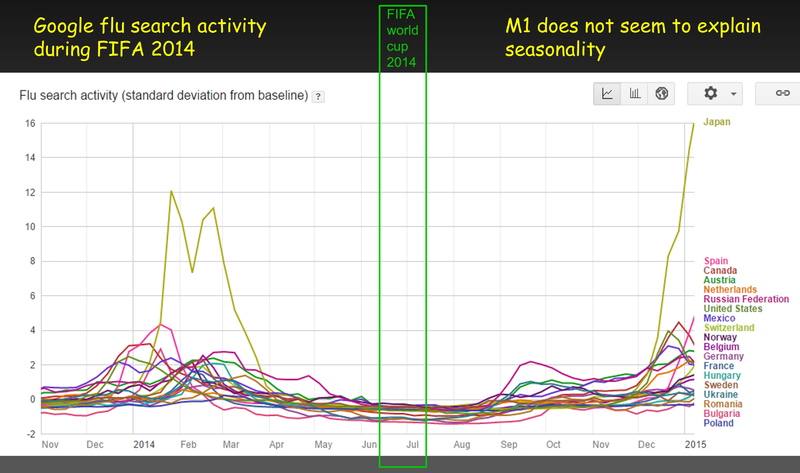 I have added labels to the plot on the right, drawing attention to some points that I found interesting. The most dangerous activities are at the top left of the plot, with the most protective at the bottom left. Activities that don’t affect the chance of dying from respiratory illness are on the right or at the middle level. Donaldson G et al. (The Eurowinter Group). Lancet 1997; 349:1341–6. 8. – Humidity: a fashionable explanation of influenza seasonality. In the last few years it has been suggested that flu seasonality is the result of the greater stability of flu virions (virus particles) in cold, dry conditions. (This comes under M2 in my categorization.) 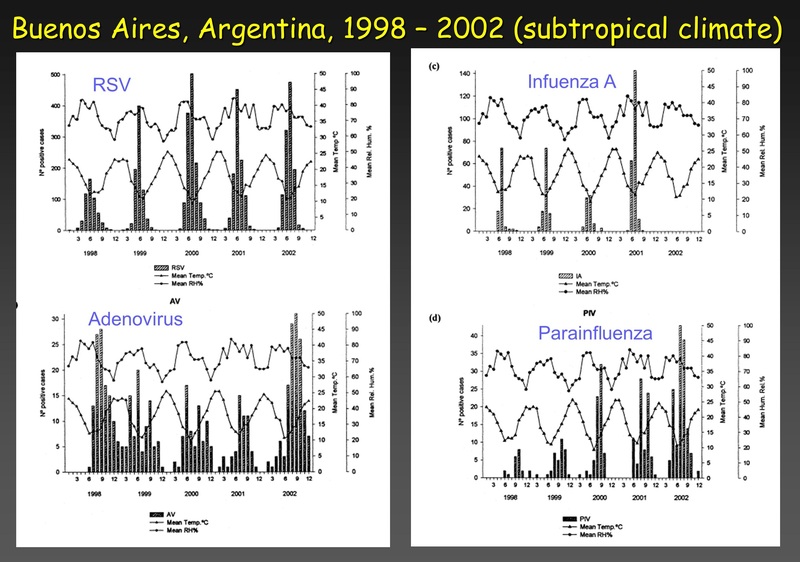 There are two major problems here: first, we have to account for the much higher levels of influenza during the rainy season in the tropics compared to other times of the year. 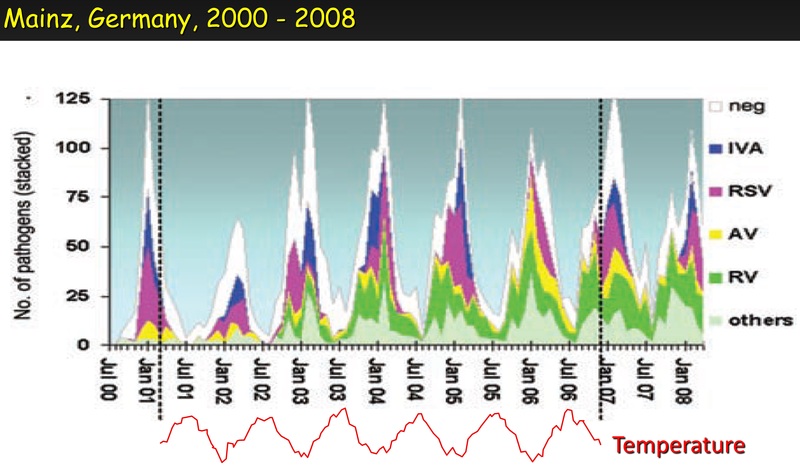 For example, in Fortaleza (northern Brazil) influenza almost disappears outside the rainy season. Second, we would have to believe that the seasonality of influenza was driven by a different mechanism to that of many other respiratory viruses. 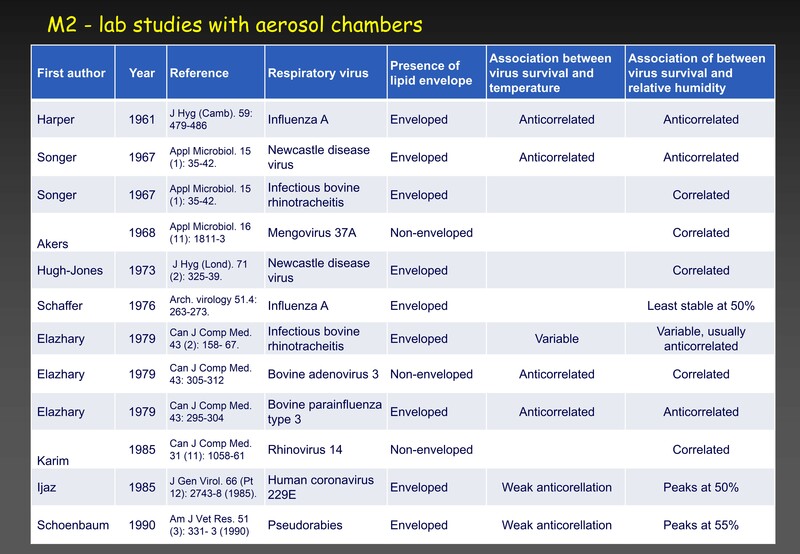 A dozen studies, shown above, have been carried out where virus aerosols were created in rotating drums (the rotation stops the virions from settling) and the stability of virions was measured in air of different humidities. The results showed that several respiratory viruses (including influenza virus) are indeed more stable in dry air, but several others, including rhinovirus and adenovirus, are much more stable in moist air! Coughs, runny noses and fevers Blog at WordPress.com.